A cloud delivered security platform that provides the first line of defence against threats on the internet wherever users go. 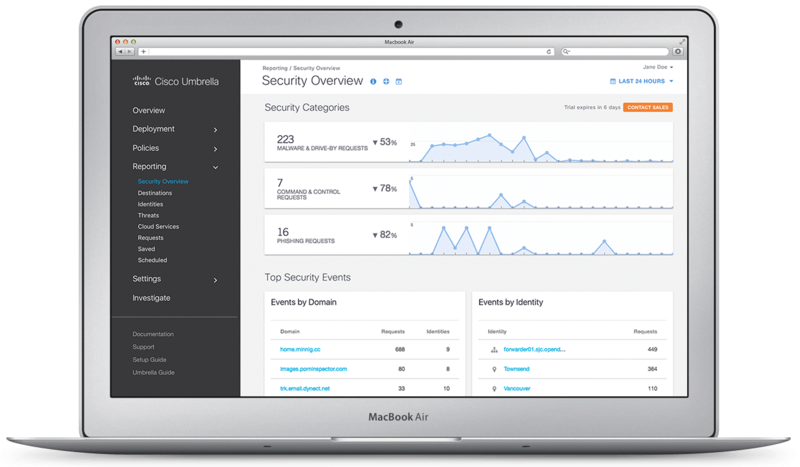 By learning from internet activity patterns, Umbrella automatically uncovers current and emerging threats. And because it’s built into the foundation of the internet and delivered from the cloud, Umbrella is simple to deploy and quickly delivers effective protection. With Cisco Umbrella, you can stop phishing and malware infections earlier, identify already infected devices faster, and prevent data exfiltration. 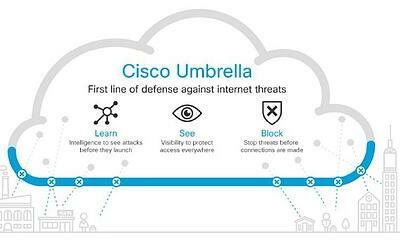 Cisco Umbrella protects against malware infections and breaches over all ports and protocols and deploys in minutes. It also offers an API to easily integrate with your existing investments.